Are you one of the many crocheters that plans to make elaborate holiday gift projects for friends and family, but continues to find yourself shopping at the last minute, straining your hands or wrists, or handing out “I.O.U.s” instead of gifts? With these five tips, you’ll be able to get a head start on your handmade holiday gifting. There are some people who just don’t appreciate handmade gifts. Start by taking those folks off your handmade holiday list. You’ll have more time for your other gifts and you’ll save yourself – and the recipient – disappointment. Most crocheters have finished projects that would make great gifts. Look through your closets to see if there is something you’ve already finished that would make a great present for someone on your gift list. Look through your existing yarn stash. You may already have yarns on hand that people on your handmade holiday list will love. Look through your existing patterns to find some ideal projects for your loved ones. (We have some great suggestions at the end of this article to get you started!) Make a yarn shopping list for any additional supplies you need. Once your patterns, yarn, and recipients are picked out, set aside some time to make holiday gift kits. Keep it old school by printing out the pattern and adding the yarn and an appropriate hook to a project bag (or clear plastic zipper bag). Or, use your phone or tablet to organize! Take a picture of the yarn and add a pattern link. Having kits on hand allows you to easily start on the next project whenever the mood strikes. Don’t set yourself up to fail by creating a demanding gift schedule that leads to resentment or injury. Be realistic about how many gifts you can finish before the holidays based on when you started your holiday crafting, your general speed and pace, and the complexity and size of your gift projects. Remember to take frequent breaks to stretch when crocheting to avoid hand, wrist, back, and neck strain. 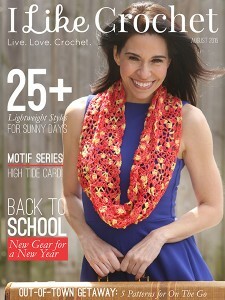 There are so many great patterns available in back issues of I Like Crochet! Here are a few suggestions to get you started on your holiday gift kits. Amigurumi make great gifts for children and adults alike! The small size of these projects makes them great for using up yarn stash. Use one of my favorites, or scroll through the rest of the Amigurumi Collection. Cowls and Scarves are wonderful accessories. Some designs are feminine but many can be made unisex by changing colors. Use one of my favorites, or look through the rest of the Cowl Collection or the Scarf Collection. Home décor items are wonderful gifts for couples, students living in dorms, and recent graduates living independently for the first time. Try one of my favorites, or discover something special in the Home Décor Collection. Shawls and Wraps make wonderful larger gifts for someone very special. Here are my favorites, or you can browse through the entire Shawl Collection. Jewelry projects are fast and make stunning gifts for the ladies on your list. You can try one of my favorites, or search for more jewelry in the Accessories Collection. And, if you’d prefer a more holiday-themed project, check out the Christmas Crochet Collection. With these tips and this roundup of great projects, you’ll be well on your way to making great holiday gifts for your loved one.